The first time I lined up for a race, I was a 5-year-old riding a chrome BMX bike. I wore a helmet that was equivalent to my body size. Now I’m 27 and I’m still hitting jumps after class. It’s a pretty nice place to be. It may be a bit childish, but I’m well aware of how fortunate I am to do it. I started traveling the mountain bike circuit at 16 and spent the next 10 years racing full-time. Eventually my focus veered toward the road, where I could make a better living and race at cycling’s highest level. I started by leading out sprinters, supporting climbers, and finding my own success at road nationals in my first full season on the road. I didn’t quite pull off a win at road nationals, but I caught the eye of the Garmin team, which sent me to Europe for some Under-23 races. I scored a few top-10 finishes there, and after a podium finish at the U23 Liege-Bastogne-Liege race in Belgium, I had a spot on a WorldTour team all lined up. I was slotted for world championships and the Tour de l’Avenir, a premier stage race in France for young road riders. 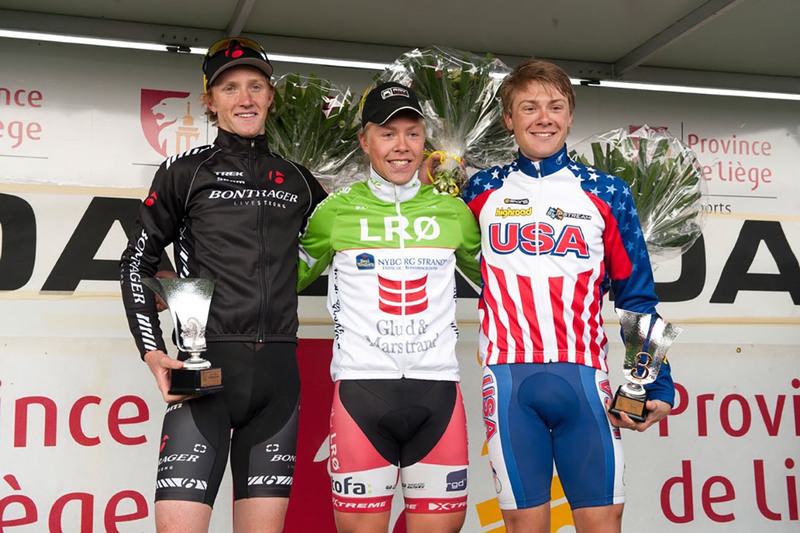 Proving grounds: A podium finish at the 2012 U23 Liège-Bastogne-Liège race in Belgium showed that Berry (right) had what it takes to race at the top levels of the sport. With some big races coming up, I headed to Courchevel, high in the French Alps, to train—and things started to go wrong. I wrecked a car. I got hit by a car. I got sick. Still, I went to Italy for the Under-25 Giro d’Italia full of hope. But at kilometer zero I was rolling down a hill when there was a crash in the group. I fell with my knee onto a chainring and sliced off my patella tendon. Unable to move my leg, bleeding on the ground in a foreign place, my team director looked at me and told me I was done. I had surgery and signed with the French Continental team La Pomme Marseille for the 2013 season. This cycle of slight success and full failure continued, and I eventually found myself back in the U.S. racing. I helped teammates win but had little personal success. Those were trying times, but I miss them. I lust for that desire, pain, and belief again. After flying through the winter of 2015, I went to the Redlands stage race in California, which I had marked for success. I finished last in the time trial. A trip the hospital showed blood clots in my leg. Terrified that it could be my last race ever, I refused to DNF the rest of that week, and continued to ride. I ended up needing surgery, which went horribly, and afterward I was rushed back to racing. I never really returned to form after that. I spent three years with the Jelly Belly team and just could not give them what they rightfully expected from me. Looking back, I really appreciate the support that team gave me. Domestic days: Berry joined the U.S.-based Jelly Belly squad in 2015 and raced with that team for three seasons. It was at the Tour of the Gila in New Mexico two years ago that everything changed for me. On the last stage, I crested the climb. The break had already gone through and there was a wreck. My teammate Chad Young was critically injured, and as we flashed by him I could see how bad it was. It’s sad to bring this back to myself, but in that moment I knew I was done. Up to that point, I had given almost everything to the bike. As a kid it was my escape, but now it was all I had. Chad, on the other hand, had balance in his life. He was smart, creative, skilled and surrounded by loving family and friends—and he was still taken tragically at age 21. I continued the season knowing it was my last. I enjoyed the time with my teammates on the road and kept training hard. My last race was the Tour of Alberta, where I made the breakaway on the last stage. Every climb I amped the pace, chased the moves, rode my heart out for any advantage for the team. Eventually the field caught me. I drifted straight back through the field and sat up. The sound of the helicopter, follow cars and crowds all stopped. I felt free, at ease, happy. I quit the sport with a quiet exit. Some guys I admired raised a glass to me and said goodbye. I may have been a no-name, but I had earned some respect. Dream machine: When Berry retired from pro road racing, he went out and bought his favorite bike, a limited edition TCR Advanced SL Maglia Rosa model. Meg McMahon photo. Even as a pro road racer, you lust for certain bikes. 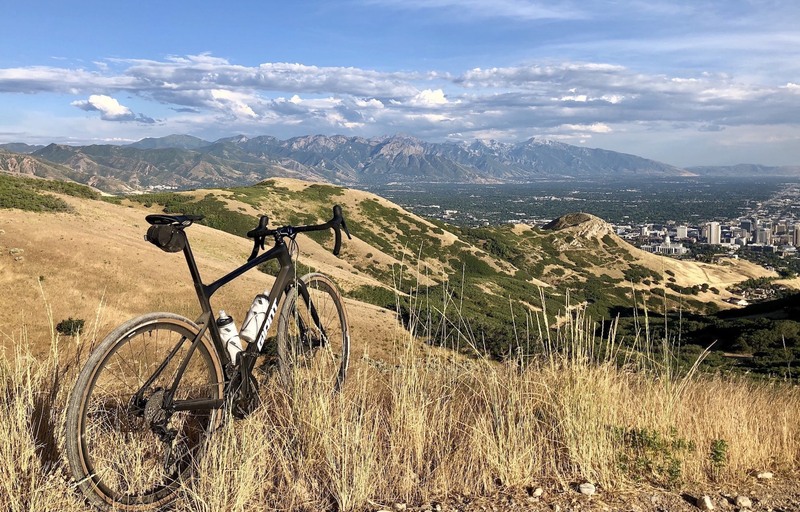 I had been buying Giant mountain bikes throughout my career and even convinced my local shop in Ketchum, Idaho, to become a Giant dealer because I liked the bikes so much. The first Anthem Advanced 29 changed mountain biking for me. I could climb as hard as I wanted and still get rad on the descent. I also had a TCX cyclocross bike that I rode in the fall on local trails. When I retired, I knew I wanted a TCR Advanced SL with Dura-Ace everything. Then I saw the Maglia Rosa edition. It was perfect, so I bought it. With my racing career finished, I took a trip to Portland and fell in love with a lady. Together, PDX Queen and I spent time riding, trail running in Forest Park and skiing around Mount Hood. One day she got the idea to sign of up for Dirty Kanza, a 200-mile gravel race in Kansas that was coming up the next summer. We are both compulsive, and even though the longest I had ever ridden as a pro was 120 miles, we committed. Roughing it: Berry made a splash in 2016 when he won the Belgian Waffle Ride, a 140-mile California gran fondo that challenges riders with up to 40 miles of rough dirt and gravel. School ended for summer, and I had a chance to go back to my old training ways. Climb mountains, big ones, skip lunch, and sleep with little oxygen and no intervals. Five weeks later, in early June, I traveled to Kansas. Estranged from my planned partner in crime, I had the ultimate crew with me: Ted King, Laura King, and Ryan Hiscoe— AKA the Velocio super squad of saviors. Ted had won Kanza a few times already, Laura is my “boss” at Velocio, and Ryan is an employee there who has the best energy. Laura ran the show and Ryan helped take care of me that week. All the important things, from rental cars to post-race Micheladas, were handled thanks to those two. And Ted let me know how to survive the race. I brought my trusty 2014 TCX with some borrowed wheels. I had Ted, a lady named Rebecca Rusch, and a guy named Dan Hughes—who have roughly 69 DK200 wins between them—giving me advice. An old teammate of mine told me he was worried I would attack with 100 miles to go. That’s exactly what I did. Then Ted felt left out so he joined. My friends took some photos while Ted and I hurt each other to get away from the other guys. Ted won, and I finished second. I did win a trophy for finishing first in the 19-29 age group, but only the overall winner gets the belt buckle. Yeah, 200 miles of headwind, dirt, and the best competition in gravel—all for a belt buckle. You can call me a buckle bunny, but I'm in for a win. I had placed a lot of hope in the DK200 but went into it sort of half-assed. After I returned home, I decided I should try to find some better partners for this new mission. I called up Giant, told them I love their bikes, maybe we can work together? So that’s what we did. Timing, they say, is everything, and it just so happened that Giant was just about to launch a killer new gravel bike. The Revolt Advanced arrived in late June, and now things were getting real. I was derailed a bit after a nasty criterium crash, but adventuring my way around town, hitting jumps, and finding snacks on the Revolt was bringing me back. Eventually, I found some singletrack and went further each day. 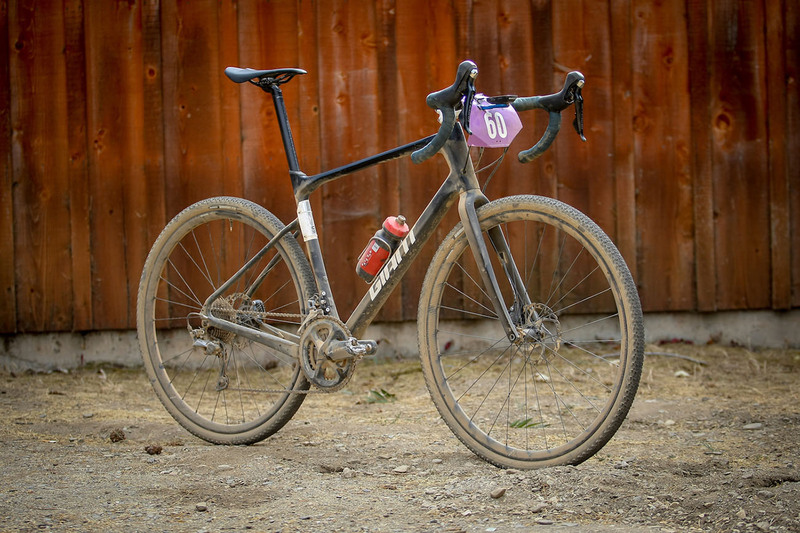 Rocking the Revolt: Berry teamed up with Giant in the summer of 2018 to race the new Revolt Advanced at major U.S. gravel events. Next came the Crusher in the Tushar, a burly high-altitude gravel party in Utah with more than 10,000 feet of climbing over 70 miles. My coach said don’t go, but I needed more mountains on the Revolt—so I went anyway. The deal was to not fight for the win, but to just be there and be a part of it. It was so hard to hold back as we started going fast. Luckily, as soon as I looked up from the gravel, the view took away the little breath that I had. I kept my cool, tested the race rig. I was reassured by how great the gravel community was, and more importantly I was with my best friend, my bike, high in the mountains. I was so lucky to have recovered from the crash and ride, let alone finish such an event. After some recovery, I headed back to Tucson to prepare for my next adventure, Gravel Worlds in Nebraska. 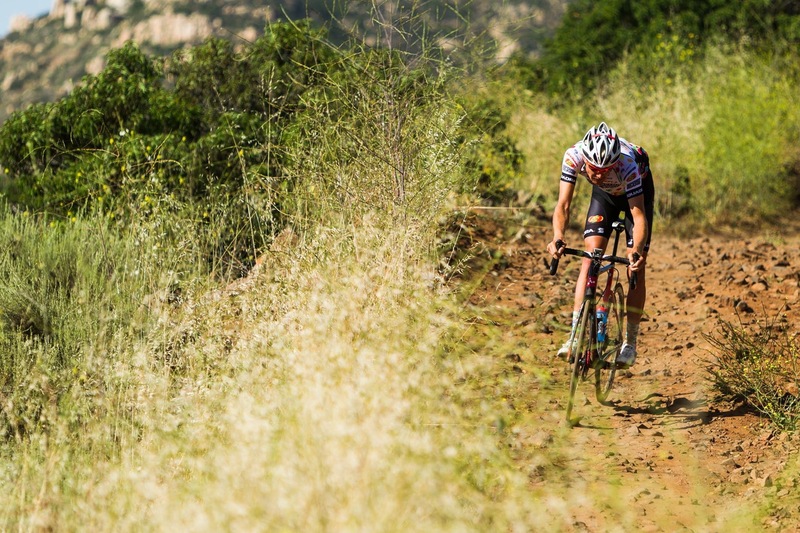 The 150-mile course there serves up 10,000 feet of climbing over endless rolling hills covered in pea-sized gravel. A group of six riders broke away early, and it included teammates of the top favorites to win. I knew I would have to push the pace, so I did. I wanted the other strong guys to come with me, I needed them to help me ride across the 5-10 minute gap that the break had on us. Time checks like that are ludicrous to overcome, but I knew I had to risk losing to make winning possible. Four chasers became three. We hit the last feed at 128 miles and caught half the breakaway there. I went to fill my bottles up, expecting all of us to wait for each other since we had been working together over the last 70 miles. But when I went to put tops back on my three bottles, the others were gone. I rushed around the corner to find they were out of sight. Up to that point, I had held back a bit for the right moment and I was confident in my chance to win. Instead the race had left as I was refueling. I didn’t chase too much after that. There is no accelerating across that gap when you’ve already been racing seven hours in the dirt. I lost the race in a situation I should have known about. I had been warned that these things happen in gravel racing, but I blew it. I had to swallow a third-place finish when I knew I was ready to win. Those guys earned it, and I am glad we worked together to make winning possible. 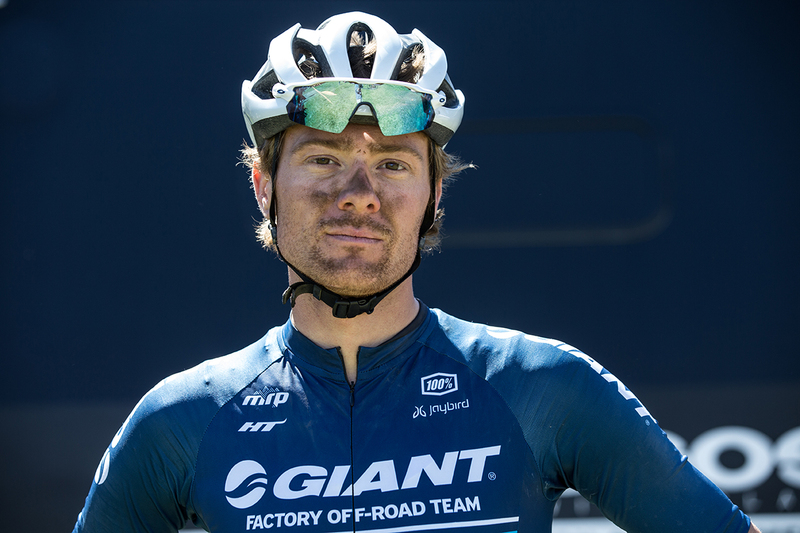 New roads: Gravel racing has offered Berry a whole new adventure, one he plans to continue in 2019. PinnedGrit photo. My 2018 gravel tour wasn’t over yet. I ventured up to Idaho the following week for Rebecca’s Private Idaho, a multi-stage event in Ketchum named after local celebrity Rebecca Rusch. The format there includes three days of racing over mountains and across scenic high-country basins. The first day challenged us with 50 miles of gravel roads and technical singletrack. I won that one, then padded my lead on Day 2, and started the main event, Sunday’s 94-mile ride, leading the overall. I was riding in a big group when a solo break went off the front and no one chased. Eventually the attacks from the group came, and we rode hard in pursuit of the eventual winner, but he was gone. We ended up sprinting for second, and I was able to take the sprint and the overall win. Way out west: Berry leads the group up a climb at Rebecca's Private Idaho, a gravel racing stage race in and around Ketchum. PinnedGrit photo. Then came Grinduro. 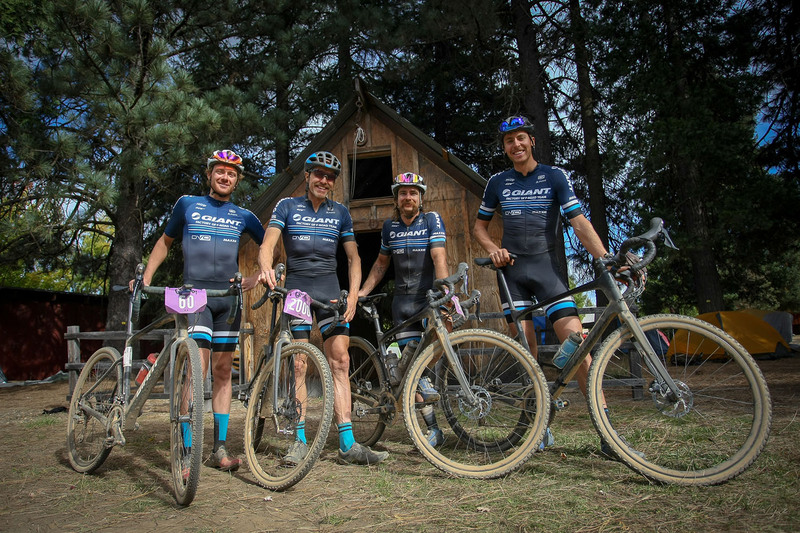 It was my first time at the half-party, half-race on the dusty dirt roads and trails of northern California, and Giant had assembled a full squad. Carl Decker was there to win the Lost Sierra Triple Crown, a three-race series culminating with Grinduro. We also had Stephan Davoust and Tristan Uhl. Tool of the trade: Berry rode this Revolt Advanced bike to a podium finish at the unique Grinduro event. Doug Barnett photo. 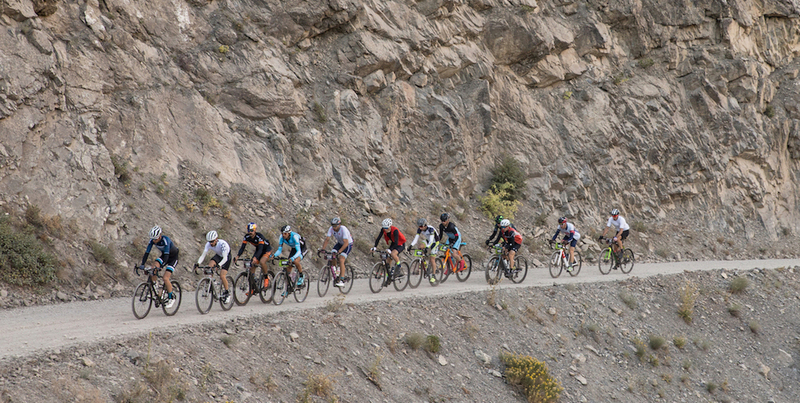 Grinduro is a one-of-a-kind event, combining a long day in the saddle including 8000 feet of climbing with four timed stages that determine your placing. I asked Carl many questions and I was lucky to follow him and Stephan around all day. Everything came together myself finishing on the podium in third. Carl and Stephen taking fourth and fifth while Carl won Triple Crown for once again crushing in all three of their events. Squad: The Giant Factory Off-Road Team at the 2018 Grinduro (left to right): Berry, Carl Decker, Tristan Uhl and Stephan Davoust. Doug Barnett photo. 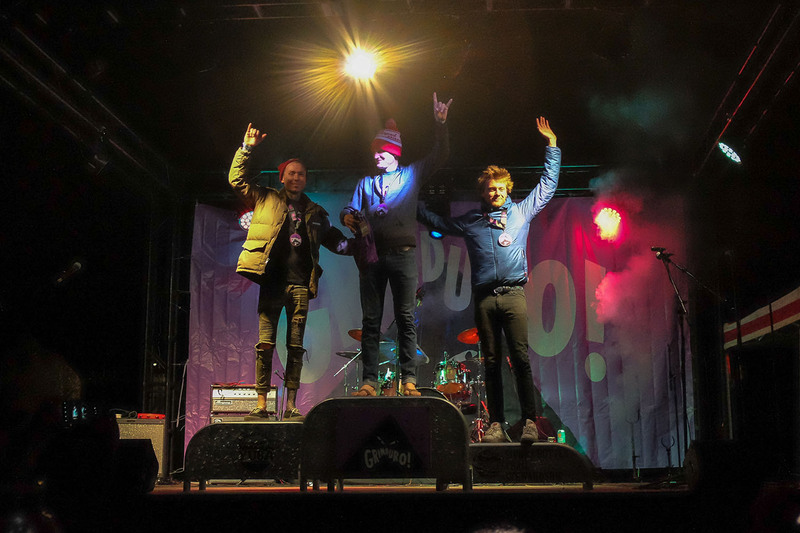 Party time: Berry (right) on the podium at the 2018 Grinduro. Doug Barnett photo. These were all new experiences for me. Throughout all of them, my bike was awesome. My coach’s preparations worked. I was relaxed, and I stayed cool. I left each event hungry for more. For now, I’m back in school, happily pushing the envelope on both ends. But I’ve already started planning next year, and I hope to step up and really give these gravel races (and others) a go. I am desperate for a belt buckle in Kansas, and to find new adventures. I’m holding back from the bike now, but I believe with support next season I can rack up the wins. I’ll stay in school, I’ll keep working, and I’ll fight for that buckle.